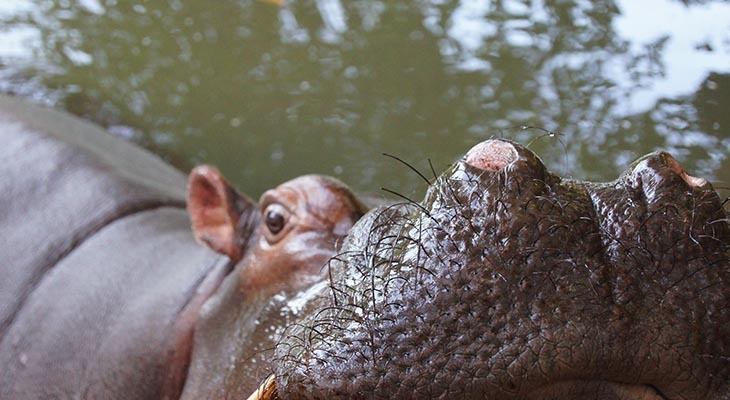 Explore the Mpumalanga province of Northeast South Africa, including the flagship park of Southern Africa, Kruger National Park. Soak up the wonders of the Panorama Route, and the wild African bush of Kruger, before hopping down to Cape Town to enjoy Table Mountain and the Cape Peninsula. This is truly a “Best of” tour for the first-time visitor. See below for a day-by-day outline! 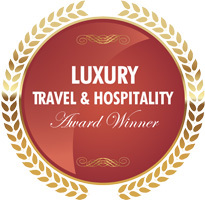 On arrival in Johannesburg you will be met by your guide and transferred to Africa Sky guesthouse. The balance of the day will be spent at leisure. Morning departure for Mpumalanga Province. Sub-tropical Mpumalanga, meaning “the place where the sun rises”, covers 79 490 square km’s and is bounded by the Kruger National Park, Swaziland and Mozambique to the east and the spectacular Drakensberg mountains to the west. Mpumalanga is a region of contrasts. Highveld grasslands dominate the western border with Gauteng, moving eastwards through bushveld to the Greater Escarpment, which overlooks the lowveld and the Kruger National Park. 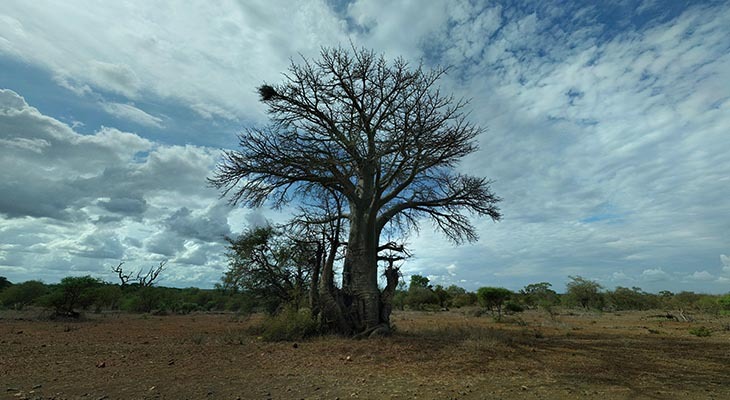 The wildlife, birds and plant life are all truly representative of Africa, and the scenery is majestic and endless. The region's attractions include game-viewing, scenic drives, and historical sites and monuments. Dinner and overnight Casa do Sol hotel situated close to the small town of Hazyview. Casa do Sol hotel is situated within the 500 hectare “Ilanga nature and game reserve” with over 100 different species of indigenous bush and breeding herds of non-aggressive game. There are on-site hiking and mountain biking trails, tennis courts and swimming pools as well as a number of water activities including fishing, rowing and boating on the resort’s private dam. Early morning departure for the Panorama Route. The Panorama route is one of the most beautiful and popular travel destinations in South Africa. 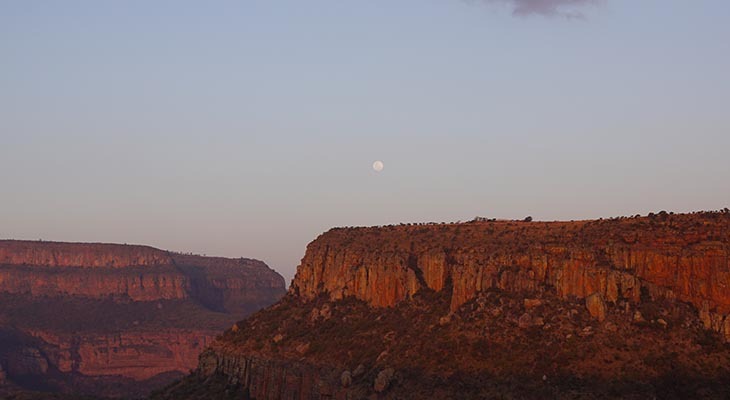 Passing the north-eastern part of the Great Escarpment of the Northern Drakensberg, the inland plateau declines abruptly and steeply and opens up fantastic views of the plains at "God's Window" of the Lowveld a thousand meters below. This view is most reliable in the dry winter months. At other times the spectacle is often impaired, since the escarpment is a barrier for the clouds coming from the east, rising at this point and bringing a lot of rain. 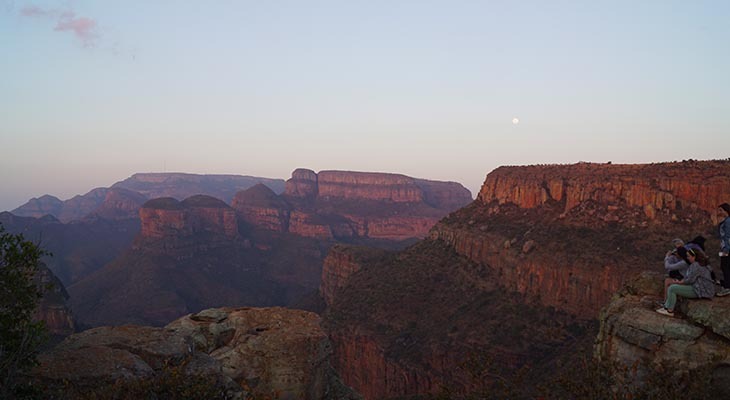 The most spectacular stretch of the Panorama Route is the Blyde River Canyon. Blyderivierspoort Nature Reserve lies to the north of the town of Graskop and is a narrow strip, which runs for approximately 57 km along the Drakensberg escarpment. It contains one of the great scenic wonders of Southern Africa, the Blyde River Canyon, which is 60 km long and is the third largest canyon in the world. Unlike the Fish River Canyon in Namibia and the Grand Canyon in America, it is filled with lush vegetation and wildlife. There are a number of viewpoints along the edge of the escarpment offering excellent views of the Canyon and the river 600 m below. From many well-positioned vantage points one has a view of the 33 km long gorge, which starts at "Bourkes Luck Potholes" and ends at the "Three Rondavels". Bourke's Luck Potholes were named after Tom Bourke who discovered gold here at the confluence of the Treur and Blyde rivers. The potholes are deep cylindrical holes formed by the action of the sand and rock carried down by the rivers when in flood. Visitors can obtain a close view of the potholes from specially constructed bridges. A museum and an information centre are open daily. The Berlin Falls can be reached by means of a path along the river where the water from the Berlin Creek falls 150 m into a large pool. The Lisbon Falls are at the point where the Blyde River splits and large pools are formed before the water cascades over the sheer cliff to a pool 92 m below. Following an introductory presentation on HESC, day visitors are treated to an in-depth tour of the Centre. Open safari vehicles with experienced guides depart on the hour. Moving between the various enclosures, guests can view cheetah, wild dog, lions, black-footed cats, African wild cats, ground hornbills, Sable antelope and much more in an up close and personal manner. Guests are also afforded the opportunity of watching rare African vultures feeding on carcass remains at the "Vulture Restaurant". This area attracts mostly White-backed and Hooded vultures, although the Lappet-faced vulture Cape Griffon, Marabou stork and Bateleur eagle also frequent the area fairly regularly. The bones and carcasses come from the bomas, paddocks and pens around the Centre, and once they have been picked clean by the raptors they are taken to a bone miller where they ground and sprinkled over the animals' meat for added calcium. At HESC nothing goes to waste! Late afternoon return, dinner and overnight Casa do Sol hotel. Early morning departure from Casa do Sol for a hot air balloon flight over the scenic grandeur of Mpumalanga! The flight is a scenic experience and lasts about an hour. During the flight passengers can relax and enjoy the spectacular views of the surrounding countryside as the balloon floats over small hills and hidden valleys. The distant views to the west are of the mountains – God’s Window is clearly visible from the “other” side. The views to the east are of the land gradually flattening out towards the horizon, with the Sabie River winding its way towards sunrise and the Kruger National Park. The vegetation is a mix of riverine forest, indigenous bush and fruit orchards, and the sub-tropical climate ensures that the area is green and lush almost all year round. This is a beautiful ballooning venue! On landing Cape sparkling wine (a Cap Classique Wine) will be served to celebrate the flight in the champagne ballooning tradition. Fruit juice and bottled water are also available. After the flight passengers join the pilot for breakfast at a country lodge, and for the presentation of flight certificates. *Please note that the Balloon flight is for your own costs, and is weather dependant. After breakfast we depart for Kruger National Park via the Phabeni Gate. Lower Sabie graces the banks of the Sabie River, one of the few perennial rivers to flow through the Kruger National Park. Visitors cannot but feel soothed by the view towards the river and the Lebombo Mountains beyond. Watching the endless procession of animals coming to drink at the Sabie River establishes a sense of one's own place in the eternal cycle. Early morning and afternoon game drives from Lower Sabie camp. Early morning game drive departing from Lower Sabie camp. We return late morning for breakfast and a rest before departing on an afternoon game drive that will see us returning to camp early evening. This morning will be set aside for a game walk with and armed ranger in the Kruger National Park, where you will be getting up close and personal with all the wildlife, birdlife and insects of the African bushveld! The afternoon will be set aside for further game drives in the area. After an early morning game drive and breakfast, we depart for Satara Camp. Because the Savannahs around Satara camp attract vast herds of antelope and other grazers, the large cats that prey on them are in abundance. Satara Camp stakes its reputation on being one of the best spots in the world for viewing Lion, Leopard and Cheetah. 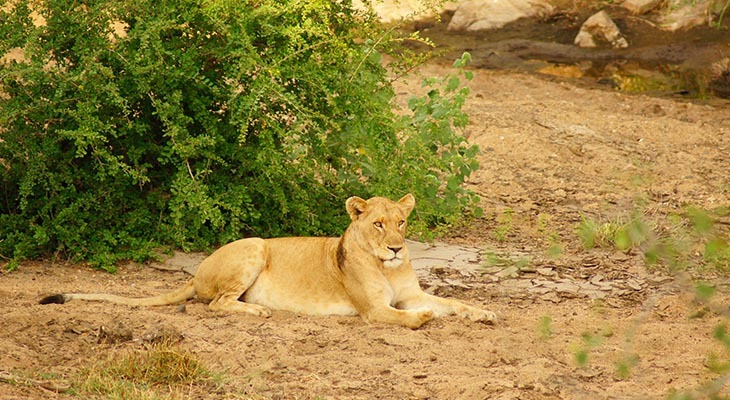 Large cats are frequently spotted in the Muzadzeni area, where a large and successful Lion pride operates, or along the S100 route that runs east from Satara Camp, hugging the bank of the N'wanetsi stream. This stretch is especially productive in winter when the veld is dry, and lion and leopard lie in waiting to ambush thirsty antelope that swarm in large herds to drink at the few remaining pools of water. Afternoon game drive from Satara camp before returning for dinner. (An optional night drive can be booked in order to observe nocturnal species and predators). Early morning game drive departing from Satara camp. We return late morning for breakfast and a rest before departing on an afternoon game drive that will see us returning to camp early evening. Morning and afternoon game drives, and in the evening a “bush braai” (bush Barbeque) held out in the African bush, combined with a night drive to spot nocturnal species will round off an incredible safari! After a final morning game drive we depart for Johannesburg via either Hoedspruit or Phalaborwa airport, and from Johannesburg we take a connecting flight to Cape Town. On arrival in Cape Town we will have the balance of the day to explore Cape Town city and surrounds. Overnight Lezard Blue Guest House. Morning departure for a tour of the Cape Peninsula – here you will travel via Platinum Mile to the picturesque harbor village of Hout Bay and pay a visit to the Mariner's Wharf before continuing to the Cape of Good Hope Nature Reserve via the famous Chapman’s Peak Drive (if open). Take the Funicular trip to the top of Cape Point for breathtaking coastal views. After lunch visit the Penguin Colony at Boulders and end off your day at Groot Constantia, the oldest wine estate in the Cape. Wander through the beautifully restored Manor House (time permitting). There are a number of short walks that you can take once on the top of Table Mountain, including the Dassie Walk (great views north, west and south), the Agama Walk (a popular route that gives you 360-degree views of Cape Town and Cape Peninsula) and the Klipspringer Walk (wonderful views along the plateau). You can also choose to spend the better part of a day hiking all the way along the top of the mountain and down to the Kirstenbosch National Botanical Garden, one of the world’s largest and most beautiful botanical gardens, or even further along, to the Silvermine Nature Reserve. The balance of the day can be spent exploring the Cape area, the wine lands and Kirstenbosch Botanical Gardens to name but a few options. Morning departure for Cape Town International Airport for your return flight.